Technological innovation and an increasingly strong focus on the integration and automation of processes: Intermac is in attendance at the most recent edition of Glasstec, strengthening the brand's position as industry leader with the world première launch of the new Master Series machining centre. 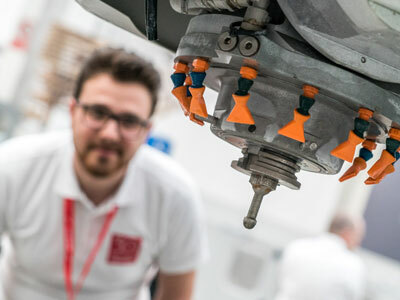 With all-new design, performance and application software (with bSolid), these next-generation CNC machines, which are capturing the attention of visitors at the company's stand (spanning almost 1,000 square metres), are set to propel Intermac far into the future, setting new standards in the glass industry for years to come. The Master 33.3, with an integrated anthropomorphic robot for loading/unloading panels, further demonstrates the enormous potential of these innovative machining centres. The Master 45.5 is designed to offer an augmented reality experience, providing multimedia interaction between the real and the virtual that is unprecedented in the world of glass-processing technology. A total of 8 machines are present on the stand, including the new Genius floating cutting tables, the Vertmax vertical solution, and the Primus waterjet cutting systems, which are revolutionising technical application possibilities in the glass machining sector.